A pair of 1934 De Soto Airflow SE sedan parts cars - From the pictures, missing too many important pieces to be very valuable. Without any idea of mechanicals, looks like body shells and a few bits and pieces. Value between $500 - 750 each. 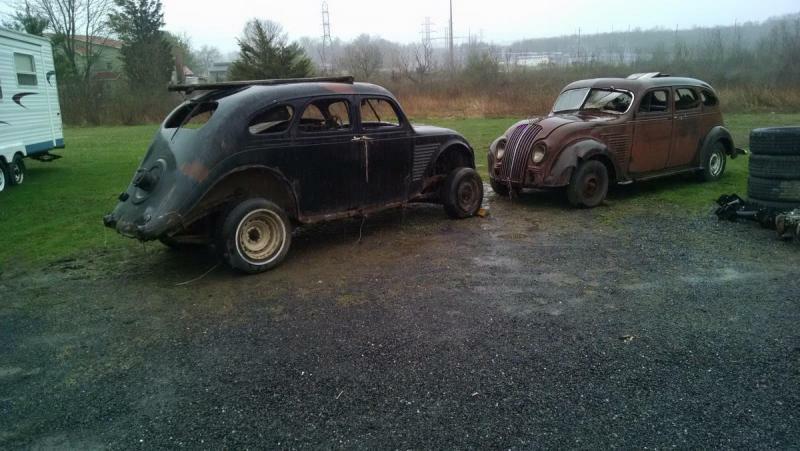 Sadly, they might be candidates for rat rods. Just not enough there to restore as whole cars (and I love Airflows) I hope someone who needs a parts car to go with their "34 De Soto will contact you. Best of luck. The unstuck engine is a plus. Certainly it's worthwhile to have an extra engine and transmission. Spare rear axles are handy to have for a driver. I don't think $1500 is out of line for the pair. Again. good luck.